Printing journaling on transparencies gives scrapbookers the ability to place titles and journaling anywhere on a page without covering up the background paper or images. This technique can be used to take the place of printing directly on large format papers, such as popular 12"x12" backgrounds. It can also be used to overlap text on photos and embellishments. Pre-printed overlays or transparencies come in a huge variety of themes and can allow scrapbooker to create quick and easy layouts. On the sample scrapbook page shown here, the journaling boxes and title have been printed on a laser jet transparency sheet. The biggest challenge when using transparencies is figuring out how to attach them to your scrapbook pages. Since they are completely clear, almost any adhesive you use will show through. Included in this step by step article are five simple techniques for attaching transparencies and overlays to your scrapbook page layouts. 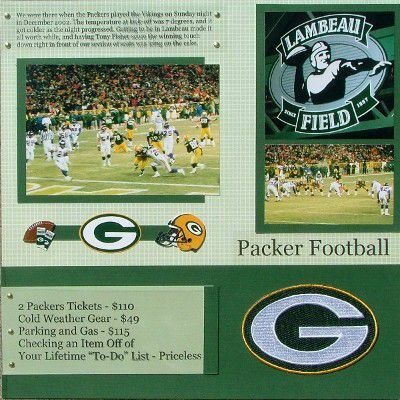 Materials Used: Printed paper - EK Success; Solid Cardstock - WorldWin Paper; Football Embellishments - EK Success NFL Line; Transparency Sheet - Office Max Brand; Brass mini-brads - Scraparts; Font - Times New Roman. Brads are one of the easiest embellishments to use. Simply poke a small hole with a push pin, insert the brad, and open the prongs on the back. On the layout shown here, brads were used decoratively and also to attach the transparency pieces to the page. Rather than using brads one both sides of the bottom journaling box, the right side was covered with a strip of cardstock that matched the background paper. This strip created a camouflaged area were adhesive could be placed to tack down the transparency piece. The beach layout shown here uses a pre-printed overlay from Karen Foster Design to completely cover the background printed paper. A small piece was also placed behind the photo mat in such a way that when the corner was folded over, the printed overlay was turned to the front. Just slightly more difficult to use than a brad, an eyelet will also work to attach transparencies and overlays to your scrapbook pages. Here the eyelet is used to not only secure the corner of the overlay but also create a place to attach some paper floss with a charm tied to it. Materials Used: Printed papers, Charm, Paper Floss, and Travel Overlay - Karen Foster Design. Occasionally, pre-printed overlays, like the one shown below will have large areas that are printed with a design or text. The hibiscus printed on this overlay creates plenty of surface area for the glue to be hidden behind. Use a clear adhesive runner so that the glue will not show through the printed surface. These five solutions will make working with transparencies and clear overlays easier and quicker. Try one on your next scrapbook page. Materials Used: Printed papers, Beach Overlay, and Snap Pocket - Karen Foster Design.